A critically endangered Sumatran tiger has died after being caught in a hunter's trap on the Indonesian island of Sumatra, an official said Wednesday. Locals told the conservation agency that a female Sumatran tiger had been seen on Tuesday caught in a pig trap set by a hunter in Muara Lembu village of Riau province. Officers immediately visited the location but the tiger was gone. 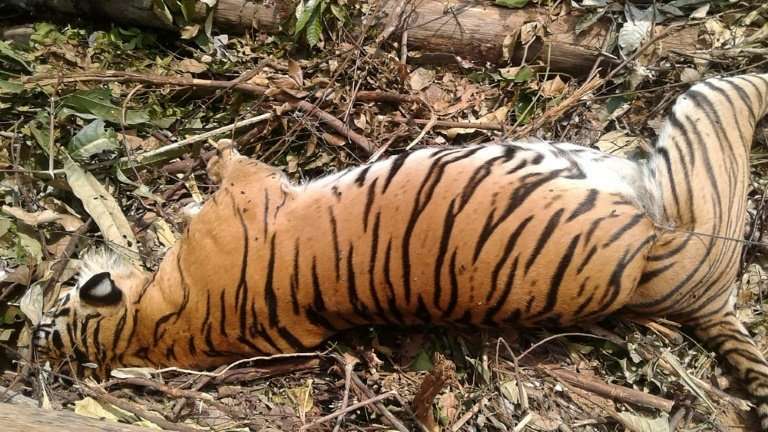 The next day officers scoured the area once again and found the tiger dead near a ravine, with rope from the trap wrapped around its belly. They believed the rope caused the animal's death. Local conservation agency head Suharyono said the death was especially regrettable because the tiger was an adult female expected to give birth to cubs. Sumatran tigers are considered critically endangered by the International Union for Conservation of Nature. There are fewer than 400 Sumatran tigers left in the wild and environmental activists say they are increasingly coming into conflict with people as their natural habitat is rapidly deforested.